What have I written with my iPhone 6 Plus? This entire post for example, pictures and everything. I’ve written entire chapters with it as well. Is it my first choice? Nope. But it happens to be a very adequate second choice. Here are four tips for using an iPhone 6 Plus as a writer’s tool. Do NOT upgrade your phone to iCloud Drive. Your files are still saved to iCloud you just won’t be able to use the Pages/Keynote/Numbers apps on the web portal until the web portal is upgraded. I put this second only because of how important it is to NOT upgrade your phone to iCloud Drive. I wanted to mention that first. Make sure your phone is set up and activated to use iCloud (not iCloud Drive). Your first 5gb is free so go ahead and do it. I discovered that I did NOT have to upgrade the web portal to see changes from one iOS device on the other. Anything I did on Pages on my iOS 8 iPhone 6 Plus showed up in Pages on my iOS 7 iPad Mini. I just couldn’t use the web Pages. 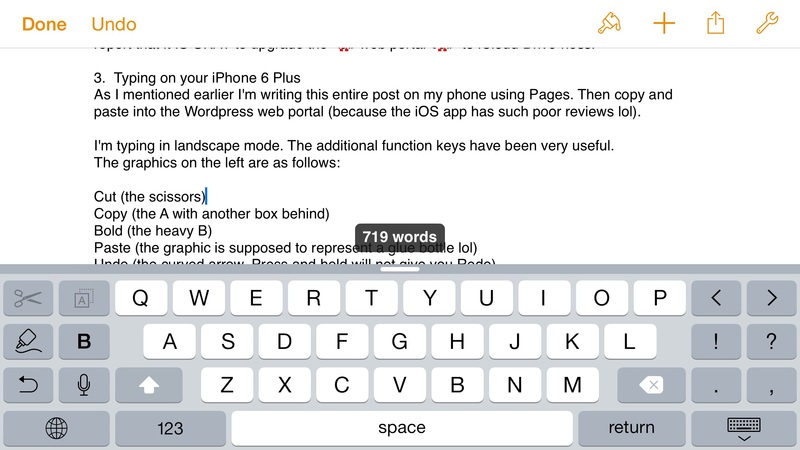 Writing using iOS Pages allows for automatic backup to your iCloud. Naturally this could be very important one day so I’ve stuck with this combo. Until you upgrade the web portal though you won’t be able use web based Pages on the desktop. I don’t have an Apple desktop or laptop at the moment but when I did I found that Mac App Pages (vs web Pages) also backed up to iCloud when set up properly. I could make changes on my iPhone 5 (at the time) and see them in the Mac App Pages file. On your behalf I bit the bullet one day concerning the web portal for Pages and I can report that it IS OKAY to upgrade the web portal to iCloud Drive-ness. As I mentioned earlier I’m writing this entire post on my phone using Pages. Then copy and paste into the WordPress web portal (because the iOS app has such poor reviews lol). I’m typing in landscape mode. The additional function keys have been very useful. The size of the phone makes it easier to type on than my iPad Mini, even when using the separated keyboard (thumbs on G and H then move apart). I’ve since given the Mini to Mom lol. The additional screen real estate on the Plus is very noticeable over the regular 6. Several of the function keys are missing from the landscape mode on the regular iPhone 6. This was another reason I went with the Plus. These are the things I tested out in-store before finally settling on a Plus model. 4. Stick to a process. I do stuff on iOS Pages and it immediately updates to my iCloud. From there I can log in to the web Pages and make changes, updates, whatever. It is automatic and seamless. Any other apps would mean using yet a second app for backup or saving. Hey, I use Dropbox too for stuff, but not for writing. When I’m again at the coffee shop I can whip out my iPhone 6 Plus and continue on with the same exact file. This way I always have notes, drafts, character updates, everything … in one place. I love writing in a small notebook with pencil but I’ve become honest with myself, I’ll have the notebook sometimes, I’ll have the Mini sometimes, but I’ll ALWAYS have my phone.